This week has not been easy to watch the pennies. Life is very busy as I am caring for my poorly grandad. It means that I have been dashing about like a whirlwind. I have needed to be at the hospital everyday which means I have not been on any yellow sticker shopping hauls this week! However there is a great deal to get FREE Easter Eggs from Cadbury’s that I spotted. However all is not lost and here is how I have been fabulously frugal this week. I found a carpark right near the hospital that is free after 6pm. This has literally saved me so much money this week. Probably about a £20. I can’t get over the cost of hospital parking. It is so expensive and it seems so unfair that this would make visiting loved ones really tricky for some on a low income. My children now have the opinion that when I go to London I need to bring them home Macaroons. I was at an event this week and there were three macaroons left and the lovely PR girls had them boxed up for my three! How generous was that! I was looking for a lovely Mothers Day bouquet last weekend and the ones I liked were very expensive. Until I went to a market flower seller who made me up a bespoke bouquet of flowers I choose. Not only was it cheaper it was bigger brighter and perfect for my mum! Our vitamix has been through its paces this past week. Chloe is on a health kick and wanting smoothies for breakfast. We bought some frozen fruit and it is much healthier and cheaper than buying shop bought. I noticed Iceland are giving away a free bag of frozen fruit when you buy three slimming world meals too. Finally if you are not signed up and using Quidco you should be because they have a great offer to get FREE EASTER EGGS simply Join Quidco, for free. Go to Cadbury Gifts Direct where you can purchase £10+ of tasty Easter goodies before the 9th April. Then sit back as a £15 cashback bonus will be added to your new Quidco account by the 16th April. Use this Direct link to Quidco to take advantage of this offer. 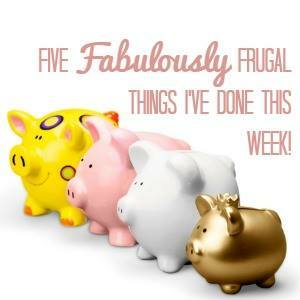 We’d love you to join in with us by sharing what frugal and thrifty things you’ve been up to this week. Whether it’s an Instagram picture (#5frugalthings), a blog post or even a video. Just add your link to the linky at the bottom of this post. Hope your grandad feels much better soon. Must be hard right now. Hospital parking charges are so unfair, it’s not as if you are choosing to be there. We found a great free car park within walking distance to ours. The frozen fruit bags are such good value and cause lots less waste too. Thinking of you, hope your Grandad is doing as well as he can. That is a great deal on those Easter Eggs isn’t it! Hospital parking charges make me really angry! We’ve had a couple of emergency visits this year and you have no idea how long you’re going to be there, and the last thing you want to think about when you’re sitting waiting for a doctor is dashing out to get a new ticket. I’m glad you found somewhere free to park. Thoughts to your grandad and the rest of the family. Fab deal on the Easter eggs! I feel like I have been buying them whenever they are on offer, so I have a secret chocolate stash for all my nieces, nephews, godchildren and extended friends families I buy for!